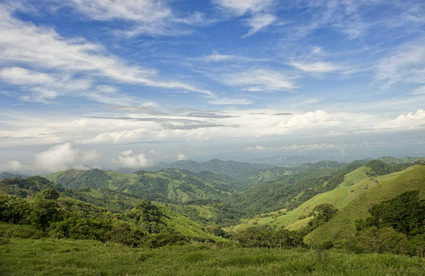 Why Is Everyone Moving to this Costa Rican Town? A lot of my friends here in Costa Rica, as well as many people I’ve met in my travels, are moving to Atenas. More than a half-dozen couples and families in the last few months have arrived in this small town in the Central Valley, a mountainous region in the interior of the country. Granted, the word about Atenas got out a long time ago. And it’s been an expat hotspot for many years. That’s what happens when AARP mentions a place in its pages and names the surrounding region as one of the top 10 places to retire, as they did in 2010. Many long-time foreign retired residents say it reminds them of the small towns in the United States where they grew up. They know all the shopkeepers in town, the young people respect the elderly, and a perfect day can be spent sitting in the park talking with friends… and making new ones. Homes radiate out from the town center, with its church and adjoining central park filled with palms and mango trees. Lush green hills, covered in farmland rise up from the outskirts of town. Rustic, open air sodas—the Costa Rican equivalent of the diner—offer dishes like the casado (rice, beans, cabbage salad, and your choice of beef, chicken, or fish) and arroz con pollo (chicken and rice). The weekly farmers’ market, or feria, is a highlight of the week. It’s a place to stock up on fresh fruits and vegetables, much of it grown in the surrounding area and brought to market by the very farmers who grew the crop. It’s like the local foods movement that’s taken off among foodies back in the U.S.—but Costa Ricans have been doing it for generations because it just makes sense. And it’s cheap too—try less than a dollar for pineapple or heads of just-picked lettuce for 50 cents. There’s also an active expat community in Atenas. Groups gather to play cards, plan trips, craft and make jewelry, and more. The number one hangout is Kay’s Gringo Postres, a small restaurant next to the Red Cross just outside the center of town. Kay’s has become a de facto community center, with a lending library and a Sunday brunch that’s to die for. It might be the only place you can get biscuits and gravy in all of Costa Rica. It also helps that the weather there is just about perfect year-round, with temperatures hovering around 75 degrees Fahrenheit on average. Never gets too hot, never gets too cold. Most homes don’t have air conditioning—you just don’t need it. And that’s good for your electric bill too. My friends are moving to Atenas for all that—and more practical reasons. One couple had a “difference of opinion” about where to live in Costa Rica. He likes rural living—she prefers the big city. In Atenas, the capital of Costa Rica, San Jose, and its western suburbs are just 30 minutes down Highway 27, one of the most modern roadways in the country. They live in country splendor, surrounded by jungle, but can easily shop at big box stores or check out a movie (in English) whenever they want. It’s just one way living in Atenas can be tremendously convenient. Other big city amenities, like the best public and private medical care—including the largest hospitals and top specialists—can be found in and around San Jose. The country’s main international airport is about 30 minutes away as well. And the beach is just 45 minutes south.